Again, I have Twitter to thank for inspiring this post. 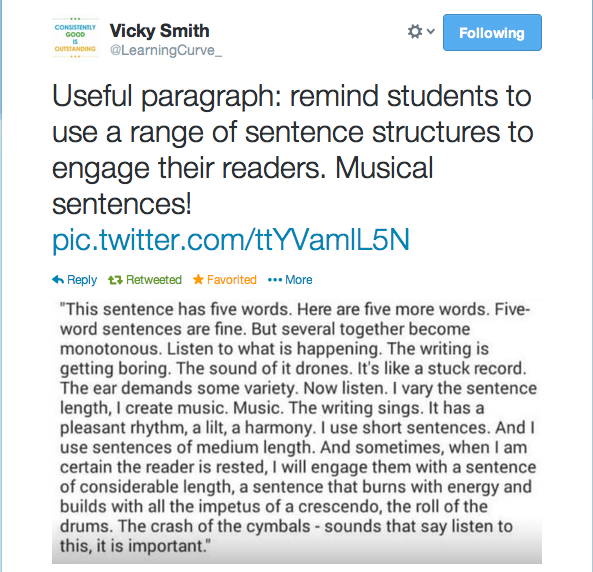 This time, it was @LearningCurve_ who shared the photo of a great paragraph about sentence length. Having spent the afternoon correcting Leaving Cert mock exam essays (yes, last-minute stuff), it struck a chord with me, so I’ve put it to Spanish – not a direct translation, but definitely modelled on Vicky’s original. I think it’ll be useful for most age groups, and it made me think about writing in Spanish for the sound of the words, rather than just the content or the correctness of language, an exercise that I think was worthwhile in itself. As always, if you spot a glaring error, please let me know! Really enjoyed this! The point is very well made- love the Spanish version. V. lyrical!! Could I have your permission to use it some time? 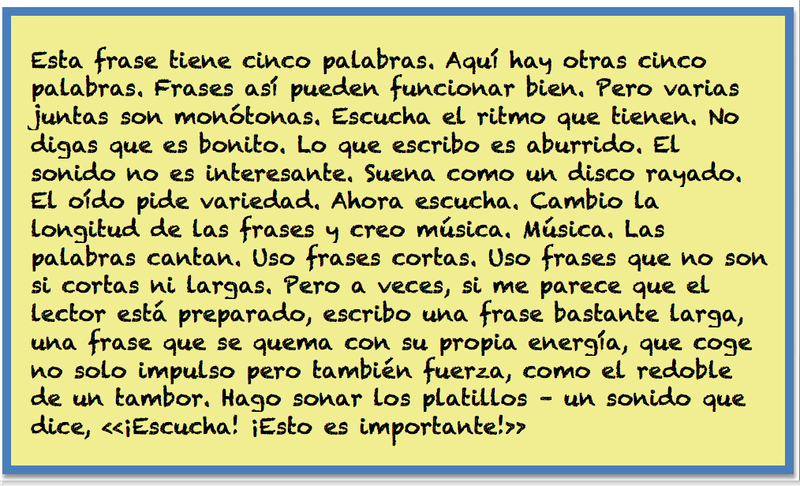 Gracias..
Gracias! Glad you like it. There’s an error in it – it says si instead of ni at one point but I haven’t gotten round to changing it yet. If you do use it, I’d love if you checked back in here and let me know how, and how it goes! ¡Suerte para el trimestre!